Obtained from select slow cooked grapes blended with a superb mature wine vinegar, our Balsamic Vinegar from Modena has a dense consistency, deep, intense colour, tart flavour and pleasing aroma. It is the result of years of careful refinement in aromatic barrels composed of fine woods. COLOR - Full - bodied, deep black. AROMA - Delicate, elegant and harmonious bouquet. A well blended aroma of grapes and tannins. FLAVOR - Rich, robust, generous and long lasting. ACCOMPANIMENTS - The intense, fresh, balanced flavour combined with a clean aromatic and lingering aftertaste makes it an ideal complement to every dish. Delicious with seafood, rice and pasta. Perfect with red or white meat and cheese. A marvellous complement to drizzle over fruit, sweets, desserts, and ice cream. The Aged Balsamic from Modena I.G.P. Red Label is obtained from select slow cooked grapes blended with a superb mature wine vinegar. All grapes are from Italian origin, worked with our patented process. This Balsamic has a dense consistency, deep, intense colour, tart flavor and pleasing aroma. It is the result of years of careful refinement in aromatic barrels composed of fine woods. ACCOMPANIMENTS - The intense, fresh, balanced flavor combined with a clean aromatic and lingering aftertaste makes it an ideal compliment to every dish. Delicious with seafood, rice and pasta. Perfect with red or white meat and cheese. A marvellous complement over fruit, sweets, desserts, and ice cream. 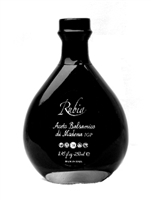 Balsamic Vinegar exceptionally dense, perfect for use in high-level culinary. Smell and Taste - Exceptionally smooth, sweet and sour aroma with typical features of longly aged Balsamic Vinegar of Modena. Typical roundness and complex, with wood notes.